It’s a blessed day in the house of mothers everywhere when, miraculously, you no longer need to buy diapers! It’s a day I anxiously await in our house, even though I know it’s at least a couple years away. While the days of diapers eventually end, there will always be reasons to keep wet wipes around. 1. In the car. 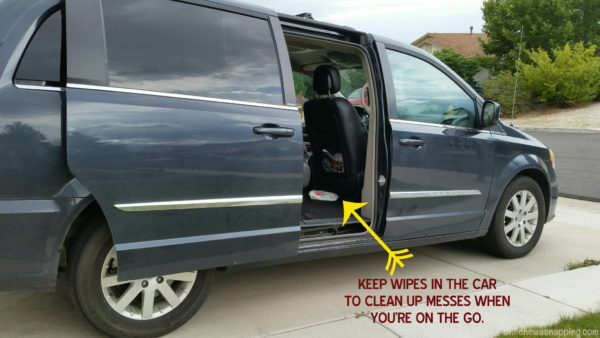 Even if you don’t have kiddos in your car routinely, you can use Huggies Wipes to clean up those little spills or keep the dust and dirt off the dash and out of the air vents. It’s nice to have some wipes to clean up your shoes or hands or feet when you’re finished splashing in puddles, hiking in the mud or dirt or playing at the sandy beach before you track all that nature into your car. Don’t let a little mess get in the way of a lot of fun! HUGGIES® Wipes helps our whole family enjoy all of our adventures. 2. In the bathroom. I use wipes in the bathroom all the time. And not once on dirty bums. Okay, maybe once… or twice. We are potty training after all. But I use them more to clean up messes like soap spills, typical bathroom grime and gunk, make up build up on the counter top, or pee puddles. 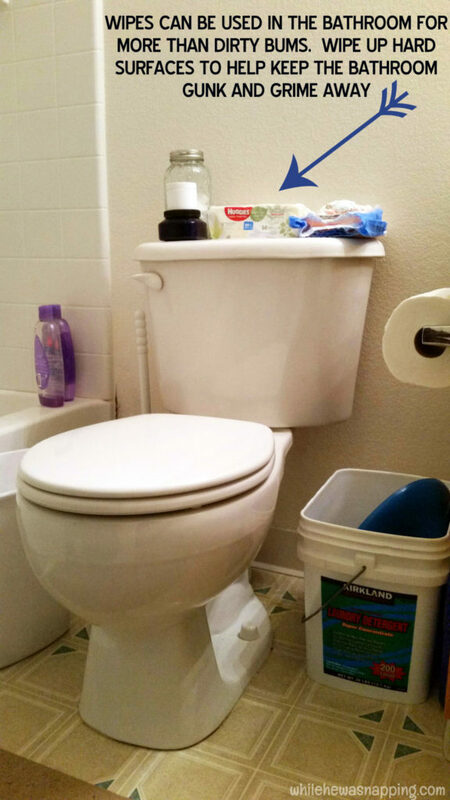 See reference to potty training above… It is a boy’s bathroom. Soap scum in the shower and soap goop on the counter are easily taken care of with a swipe or two of a wipe. I love Huggies Wipes for cleaning up after bathtime. It allows my boys to be a little more independent with their bath routines, but I can clean up any bath time play and soap spills with one or two swipes. 4. In the kitchen. 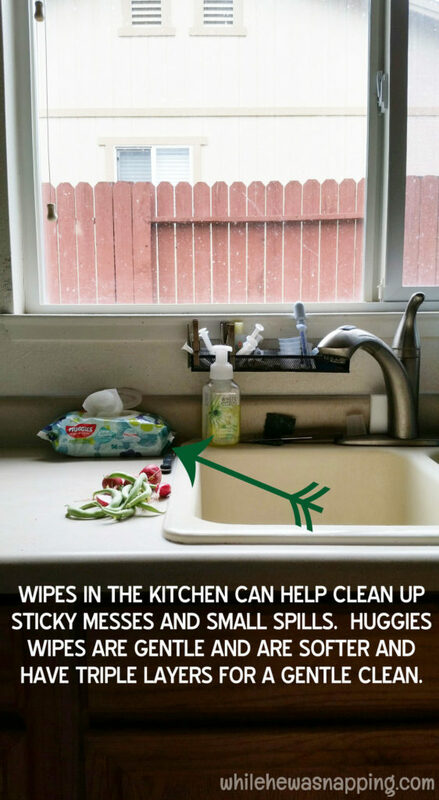 Little kitchen spills are perfect messes to use wipes on. Whether it’s wiping up faces and hands after dinner, cleaning up the sticky Popsicle someone left on the counter or the juice spilled on the floor. I love that using a wipe keeps the sticky messes to a minimum, is gentle on my boys’ faces and makes it easier to keep up with the messes in my kitchen. Dinnertime doesn’t have to mean messes! 5. On vacation. Whether you’re visiting Grandma, exploring somewhere new or making a weekend beach or mountain getaway Huggies wipes can come in handy for lots of life’s adventures. Keep grandma’s treasures as clean as they were before you arrived, clean up minor scrapes and injuries, freshen up dirty hands and faces, and get off that pesky beach and that seems to creep its way into every crack, crevice, nook and cranny. The photo is of an actual suit case we took with us on vacation to North Idaho before I unpacked it. I didn’t even have to stage the wipes in it, they really were already there. 6. In the Office. 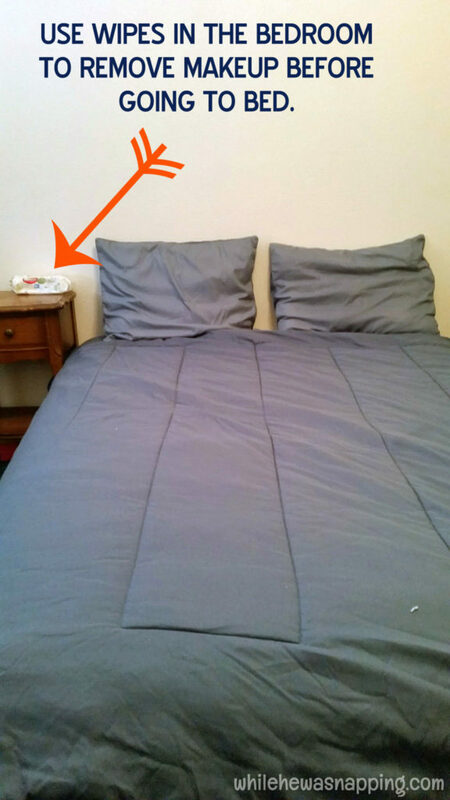 I use Huggies wipes in my home office often. Mostly, I use them to clean off wet and dry erase markers from my white board. They are also great for a quick computer or tablet screen wipe down. 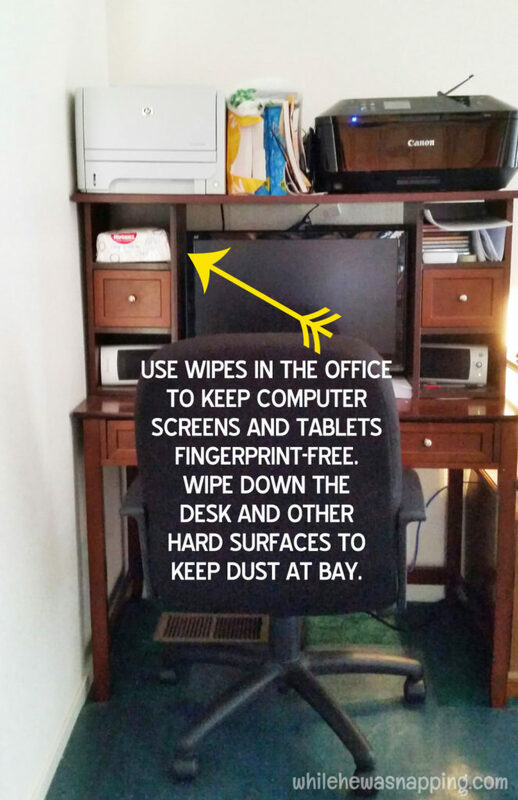 Dust and grimy fingerprints are no match for a quick swipe with a wet wipe. 7. In the Classroom. I am not a professional teacher, but my children’s educations are one of my top priorities and as such we have a small space dedicated to learning activities. Wipes play a major roll in our learning activities. We have an easel with a white board on one side and a chalkboard on the other. 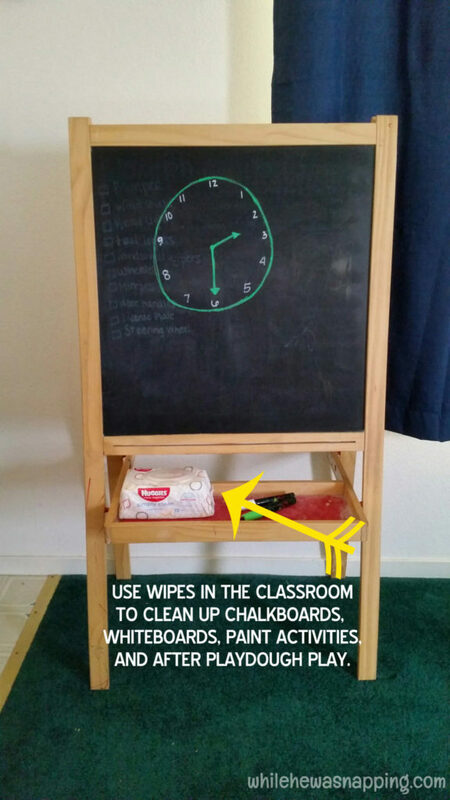 Wipes render a clean surface to practice spelling, writing and other concepts on the boards. They also make quick work of left behind play dough residue when we play with Play dough. They clean up paint activities and have even been used to scrub crayon off my counter top. We do a lot of learning activities during play time too and Huggies Triple Clean Layers helps keep the messes under control so we can learn and have fun! 8. At the Store. 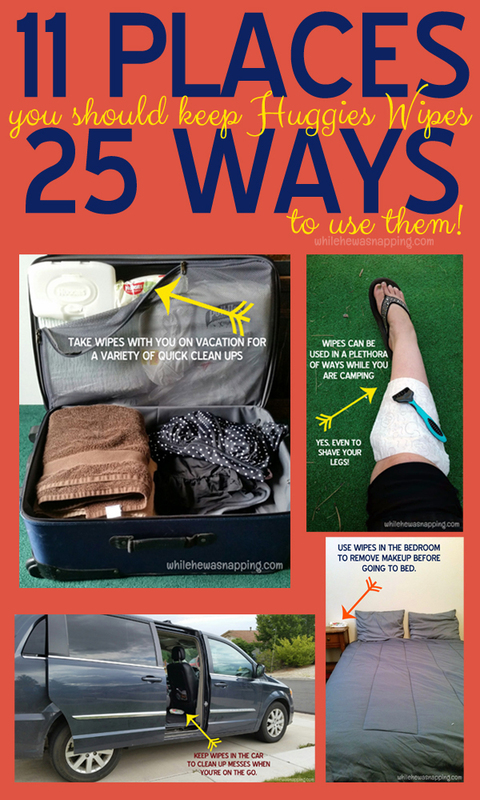 Have you ever wiped down a shopping cart? If not, you’re probably doing yourself a favor. Huggies wipes can help get the worst of the gross, grimy yuck off your shopping cart. I always try to wipe off the handle at least when we go to the store. It’s a little more peace of mind for me when my baby inevitably licks it. Gag factor=10. 9. At the Park. We use these epecially if we are going to have snack time while we are at the park. My kids are dirt magnets and the last thing I want to do is hand them a snack to hold with their grubby dirty hands. A quick wipe down helps me ensure they aren’t ingesting all those playground germs with their mid morning snack. And I’ve cleaned up more than one scraped hand and skinned knee with a wipe before. 10. Camping. 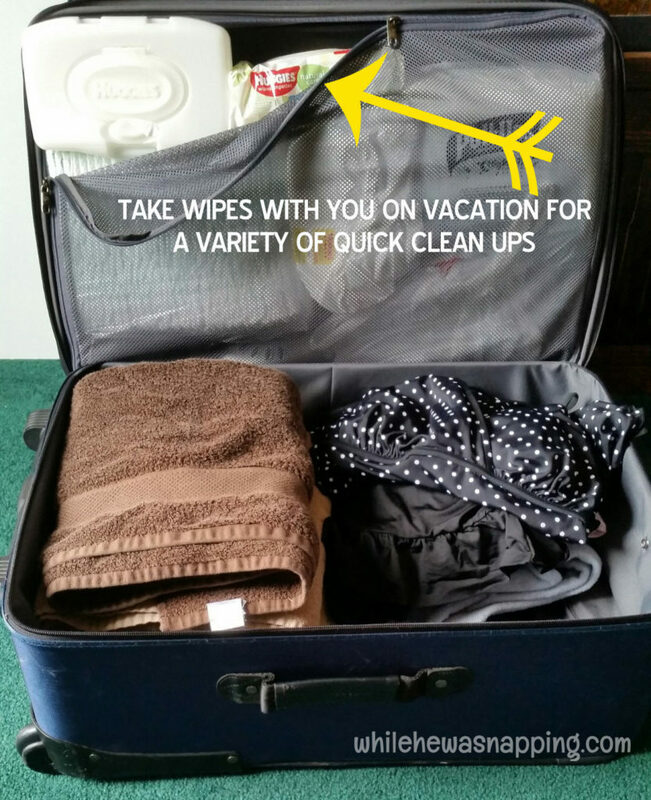 We just spent a week camping and wipes were one of the first things I packed. I lost count of how many times we used them to clean up the boys’ faces, hands, and feet. We used them to clean up our high chair tray and our boys that still use their fingers to eat with at meal times. There was even a wipe down for me every couple days. Because even that is better than not showering for a week. 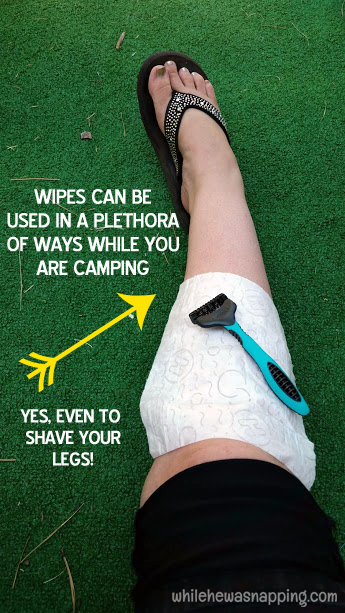 I also used a wipe to shave my legs while we were camping. Yes, that actually happened. And it worked so much better than the dry shave I attempted a couple days before. No razor burn when I used the wipe. 11. In the yard. 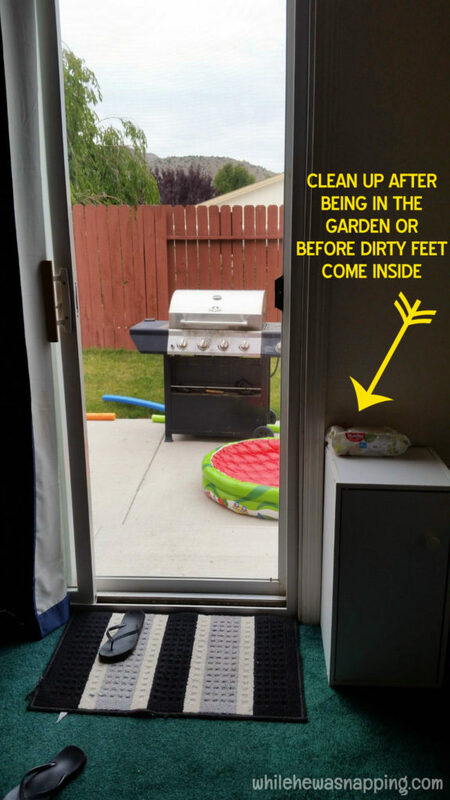 We don’t actually keep Huggies Wipes in our back yard, but they are right inside the back door. These are for cleaning off hands or feet after I’ve been out in the garden or for when my toddler ends up covered in grease or when my boys have been particularly adventurous in their exploring and damage control needs to be done before they are allowed back into the house. Great tip about shaving with wipes. The only pets we have are fish and a lizard. I do use the wipes to clean off the outside of the tanks from all the gross fingerprints my kids put all over them though! Not sure my lizard would like it if I tried to give him a wipe bath. Haha!